Behold a shining pan of blueberry-crumb muffins just out of the oven — notice the crumb-topping continental drift over the blueberry-batter world oceans. 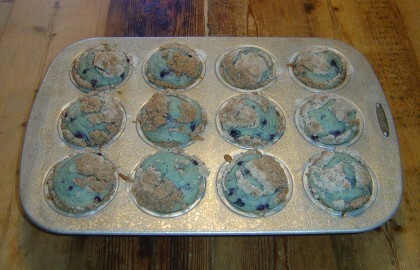 And why are the oceans so blue, when commercial blueberry muffins are at most just lightly browned from baking? Well, because it’s December, I used frozen blueberries instead of fresh, and frozen berries will generally leak a lot of juice while thawing and when you’re mixing them into batter after thawing them. I also want to note that I used Trader Joe’s organic frozen “wild” blueberries, which are very tiny, but regular-sized blueberries are fine as well. 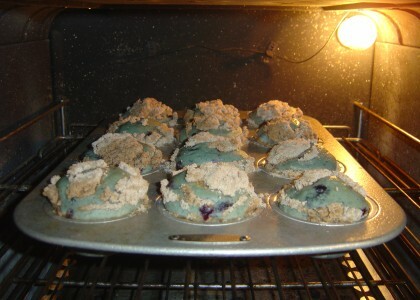 There are four kinds of muffins I make all the time — corn muffins are one of the others, and I’ll talk about the other two in some future blog entries, but, yes, today’s posting and recipe will be these blueberry (or other fruit) muffins with crumb topping. 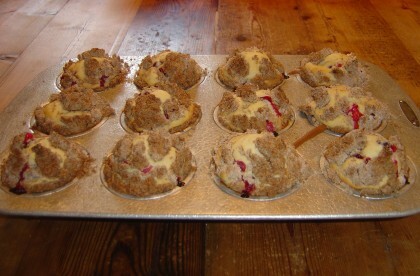 During the summer I’ll make these with fresh fruit from the yard — blackberries or diced plums — but during the winter it’s likely to be frozen blueberries or olallieberries, or even fresh cranberries, as with these cranberry- crumb muffins I made two days ago. Set the oven to 400°. Cut the 5 tablespoons of butter into three pieces, put the three pieces into the three muffin cups at one end of your muffin pan, and put the muffin pan into the oven to melt the butter while the oven pre-heats. When the butter is almost all melted, take the muffin pan out of the oven, and set it aside to cool. Put the 2 cups of flour, ½ cup sugar, and the baking powder, salt, and nutmeg into a large mixer bowl or other large bowl, and briefly mix or stir. Add the egg and milk to the bowl. If you’re a fan of the lemon-blueberry flavor combination, add a teaspoon of grated lemon peel and/or a teaspoon of lemon extract to the bowl as well. Thoroughly mix the wet and dry ingredients. Now that the muffin pan and melted butter have cooled down a little, tilt it above the bowl so that the melted butter pours into the bowl. Mix the melted butter into the batter. Using a pastry brush, basting brush, or with a plastic bag or piece of plastic wrap over your fingers, lightly grease all the muffin cups using the melted butter still sticking to the muffin pan. 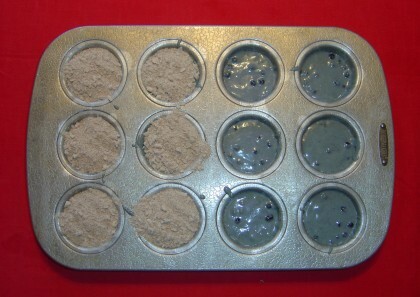 Gently fold the blueberries into the batter to distribute them evenly without mashing them. And now for the crumb topping: Put the ½ cup of flour, 2 tablespoons of butter, and the brown sugar and cinnamon into a medium bowl. Use a pastry blender to blend and chop the topping ingredients until they look like fine crumbs — personally I use one hand to keep the bowl spinning while chopping away with the pastry blender in my other hand, but I don’t know if that’s how other people do it. Spoon the crumb topping evenly onto the cups of batter — about a heaping tablespoon for each muffin. In this picture I’m halfway through adding the topping — once again, the batter is this slate-blue color due to juice leakage from thawed frozen blueberries. Bake for about 24 minutes, until done — the berries should be bubbling, and a knife stuck into a non-berry area should come out clean. Makes 1 dozen muffins. As with most baked goods, these are good cold, but incredible hot — the best time to eat them (or present them for breakfast in bed) is right after you take them out of the oven. Instead of using one cup of milk, I used the half cup of buttermilk and a half cup of milk. Due to the acidity of the buttermilk, I reduced the baking powder to 2 teaspoons, and added one teaspoon of baking soda. I added a teaspoon of cinnamon and a teaspoon of vanilla to the batter instead of the optional lemon peel and lemon extract. I will also note the amount of cranberries I used — half a pound. I added a half cup of chopped walnuts to the batter, and I added another three tablespoons of them in with the crumb topping as I was chopping it up with the pastry blender. I was already a big fan of this sort of crumb topping, but I thought the walnuts really improved it both in terms of adding extra depth and dimension to the flavor and making it even more crunchy, taking this batch all the way to “best cranberry muffins ever” status IMHO. I would say that I will definitely stick with the walnuts from now on, unless I’m making a batch for someone who dislikes nuts.